Monitoring QoE and QoS of HLS and MPEG DASH streams. Check video quality, audio quality, TR 101 290 errors, files presence, resolution, frame rate, duration, YUV format... and more! Get alerts and reports if problems are detected on your HLS and MPEG DASH streams. Adaptive Streaming Monitor (ASM) is a complete solution to measure and monitor the QoE (Quality of Experience) and QoS (Quality of Service) of your HLS and MPEG DASH streams. ASM produces perceived video quality scores expressed on a MOS (Mean Opinion Score) scale. ASM's perceived video quality metrics are dedicated to HEVC (H.265), MPEG-4/AVC (H.264) and MPEG-2 video encoding formats. These video quality metrics have been optimized to produce quality scores which are highly correlated with human jugdments collected during subjective quality assessment tests in normalized conditions (ITU BT.500 and ITU BT.710). ASM can process HLS and MPEG DASH streams on both HTTP and HTTPS servers. Concerning MPEG DASH: for now, ASM supports the 8 first description types given by the DASH Industry Forum on this page: http://testassets.dashif.org/#testvector/list. Support for additional types of descriptions is under development. ASM is a software product. It works under any Windows version (XP, Vista, Seven, 8, 8.1, 10 and Server editions) and is easy to install (especially if you just want to use the no reference metrics, in this case you just have to run the installer and click on "Next..." several times). It can run on virtually any PC. It can even run on a laptop. If possible, the recommended configuration is: 4-core CPU or more, 3 GB of RAM, 10 GB of free hard disk space. 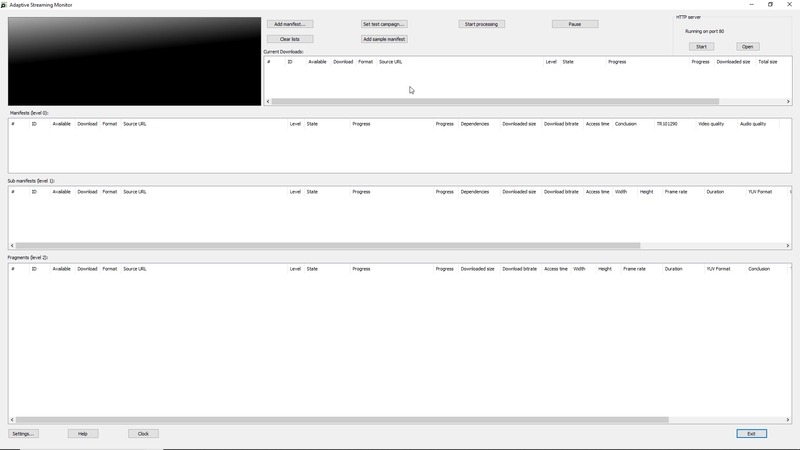 At start up, ASM displays a window which enables to enter the URLs of HLS and MPEG DASH streams to monitor. Simply enter one or several URLs and click a button. ASM will download each HLS and MPEG DASH manifest and all the specified video segments. During processing, ASM displays the currently downloaded files and the status of each processed manifest or video segment: download bitrate, access time, resolution, duration, frame rate, YUV format, detected TR 101 290 errors, video quality and audio quality. ASM uses the same video and audio quality metrics as Video Quality Monitor. You can specify the number of files that you want to download in parallel. Measures are propagated from video segments (level 2) to sub-manifests (level 1), but also from sub-manifests (level 1) to manifests (level 0). 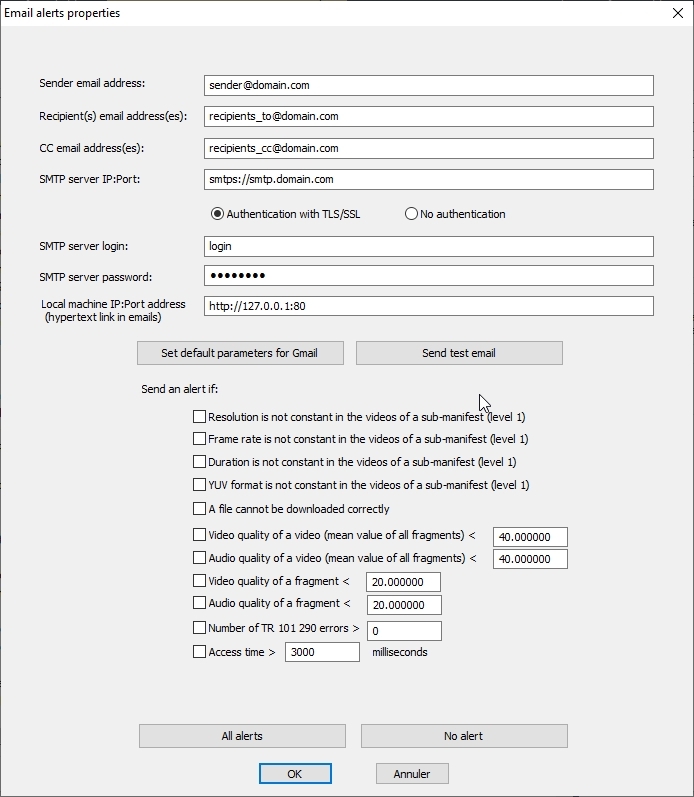 Based on these measures, ASM can trigger alerts by email or SNMP if problems happen. In the background, ASM permanently saves its measures in order to be able to generate monitoring reports. These reports are available in ASM's web interface. Indeed, ASM includes its own web server. There is no need to install a separate server (like Apache): ASM's web server is already fully included in the application. 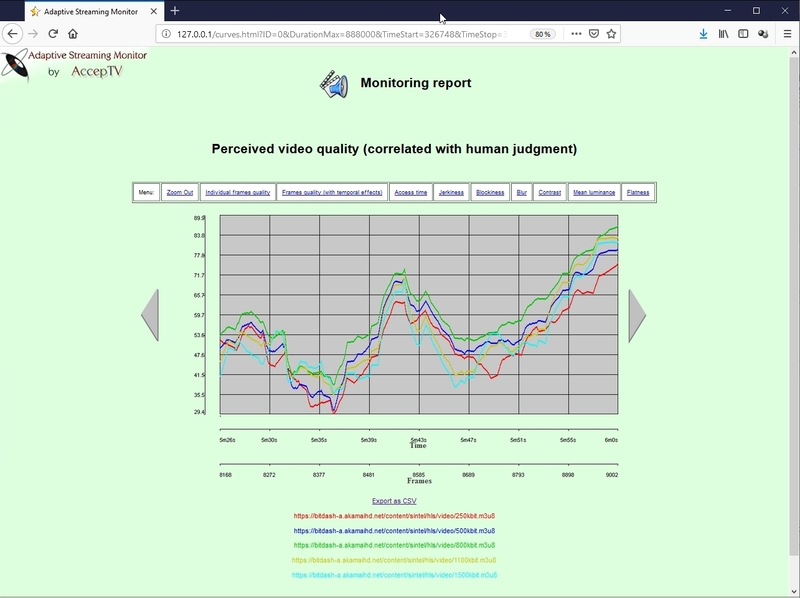 This web server enables you to connect from anywhere and get the measurement reports (available in HTML and CSV formats) and quality curves along time. You can even get the quality curves of several encoding profiles on the same graph. To connect to the web server, all you have to do is opening a web browser (Internet Explorer, Mozilla Firefox, Chrome, Safari, Opera...) and go to URL "http://IPADDRESSOFTHEMACHINE" (replace IPADDRESSOFTHEMACHINE by the IP address of the machine which runs VQM). On the local machine (that runs VQM), you can use the URL "http://127.0.0.1" to display the web interface. By default, the web server uses port 80 but if you already have a server listening on port 80, you can change this port number.